iCarly. . HD Wallpaper and background images in the iCarly club tagged: icarly hq photoshoot miranda cosgrove nathan kress. 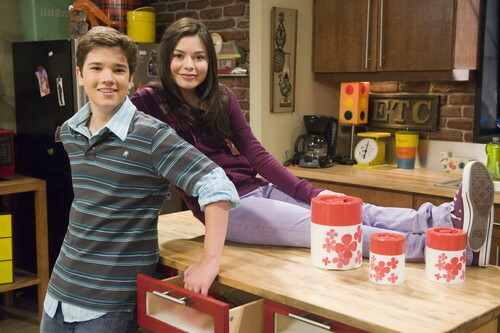 This iCarly photo contains रसोई and रसोईघर. There might also be हस्ताक्षर, पोस्टर, पाठ, चॉकबोर्ड, साइन, साइन इन करें, ऊपर का कपड़ा, overclothes, ऊपरी वस्त्र, ओवरक्लाइट, tamale, and तामले.